When Laurel and I built our first homes back about 15 years ago, hardwood was considered a luxury. Certainly not in a first time home owner’s budget!!! I remember scrubbing the “not-so-easy-care” vinyl flooring in my kitchen and wondering why there were divots in it that collected all the dirt. 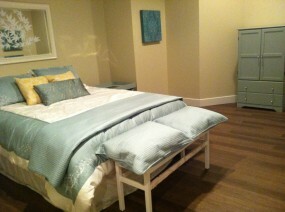 After being in our home for about 4 years, hardwood floors became more and more popular. We ripped out our carpet and replaced it with shiny, bleached birch hardwood floors. I fell in love with hardwood floors and have been in love with them ever since. But I will admit that hardwood floors do show their wear and tear over time. Laurel and I always tell our clients who are building homes….”We love hardwood floors, but wood is a natural product and it will dent and scratch, but that’s part of its beauty.” Yes, hardwood floors can be resanded and refinished, but be prepared to find a thin layer of dust over your entire home for months to come. Recently, we have found a couple of hardwood floors that are more durable and look fantastic. Our good friends Doug and Andrea recently hired us to help pick out the finishes for their brand new home. We were honoured and up for the challenge as their home is a nod to 1950’s architecture and design. 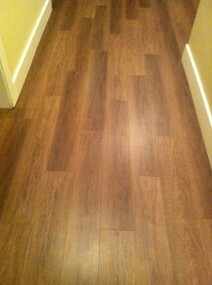 Andrea loved the look of hardwood floors but she didn’t want the nicks and scratches that come along with it. On a trip to Tierra Sol, one of our tile distributors, Andrea fell in love with a porcelain tile that looks like hardwood but is hard as nails. This floor is virtually indestructible. 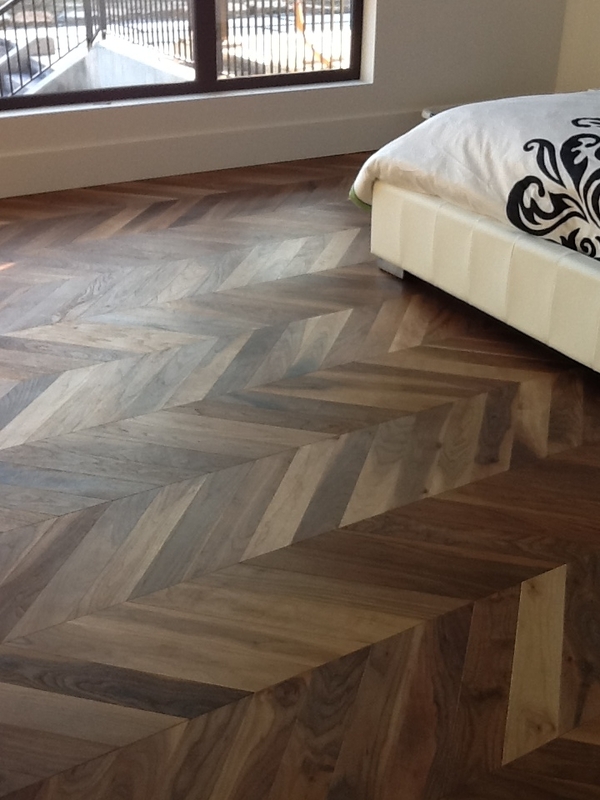 This floor comes in 3 different sizes and can be laid in a modular pattern that mimics the look of real wood. A view of the tile floor in the great room. Supply cost of the tile is approx. $15.50/square foot. I recently put in a, horror of horror, vinyl product in my basement. We have had so many issues with flooding in our basement (we’ve replaced the carpet twice already), so I wanted a water resistant product. This vinyl plank flooring looks great, is super durable, feels great on the feet and can be relaid if, heaven forbid, we have another flood. Cost for supply and installation is approximately $7.00 per square foot. Back to Doug and Andrea’s house….Andrea is the biggest J Crew fan around and she found the inspiration for her master bedroom floor from one of their showrooms. http://www.style.com/stylefile/2008/10/jcrew-opens-at-79th-and-madison/ She really wanted to find a wood that could be laid in a chevron pattern. We found a walnut with an oiled finish on it. 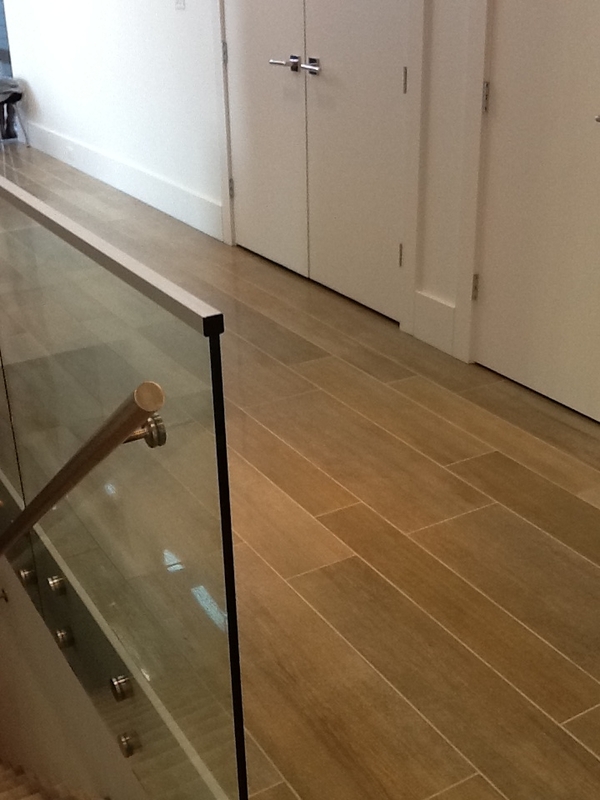 Oiled floors tend to wear better over time as they are not stained and nicks and scratches can be somewhat camouflaged by applying the correct oil. These floors can be re-oiled as necessary. We had to find an engineered wood for them as there is in floor water heating. This is not an easy product to manufacture because of the pattern, but it was so worth the splurge! 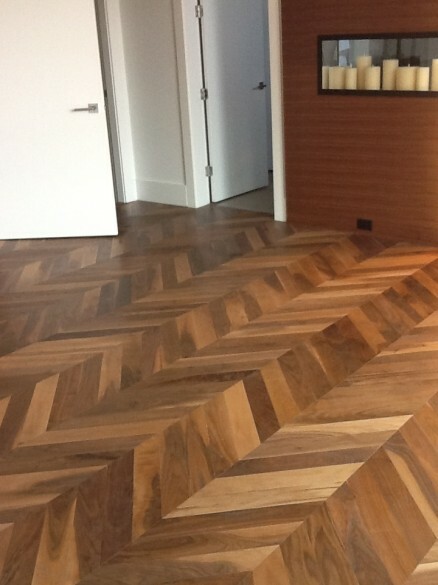 Laying this beautiful wood in a chevron pattern was SO worth the splurge! 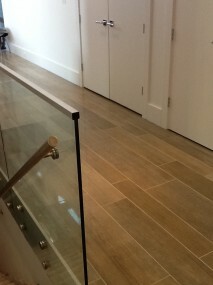 The vinyl strip flooring and the walnut flooring were supplied and installed by Kingston Flooring Brokers in Abbotsford, B.C. 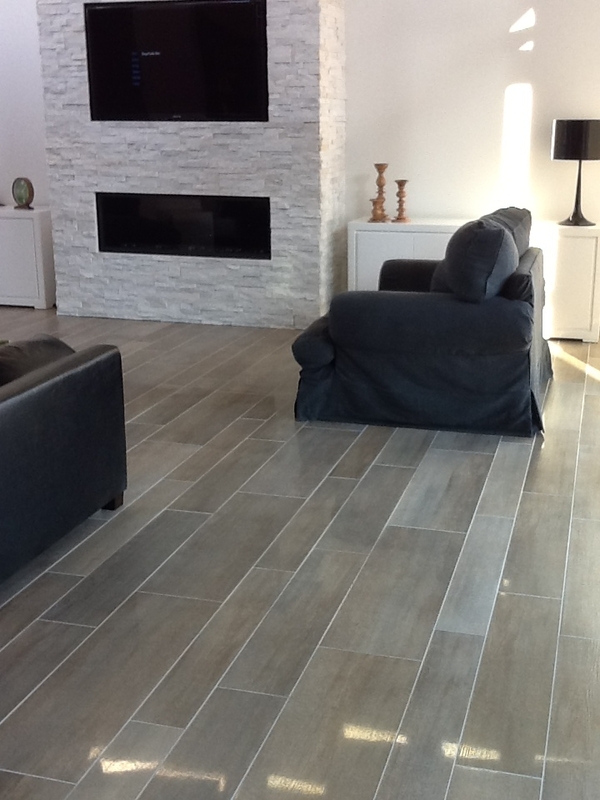 (604) 852-0951http://www.kingstonfloors.com/ The tile was purchased directly through our wholesaler, Tierra Sol, but it can also be purchased through Kingston Flooring Brokers.